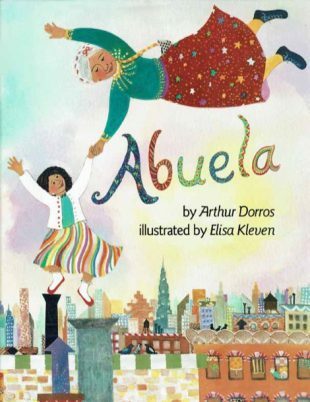 Abuela, Arthur Dorros and illustrated by Elisa Kleven. NY: Dutton, 1991. Share other books about grandmothers. Use “Luka’s Quilt” to compare Abuela and Luka’s grandmother. Make grandmother “character maps.” Compare with each other and with the grandmother in the story. Write about a memory with a grandparent. Abuela and her granddaughter take a tour of New York City. Use the book “New York City (Cities of the World)” to plan a one day trip of the city. Imagine you can fly around your own city. What would you see? Draw and color what you would see, or write down the experience and record what you see. For an art project, give the students white paint and blue paper. Have the students look at the end sheets of the book. Let them imagine what they see in the clouds and have them draw what they might see if they were flying around the city. After the page is dry, have them draw themselves in with crayon. Abuela and her granddaughter are preparing to take another adventure in a boat at a park. What will happen on this adventure? Write about it, and include yourself if you want. Have the students talk about what their grandmothers are like. Discuss that not everyone has a grandmother and mention other special older people such as grandfathers, aunts, uncles, or family friends. Make a bulletin board display using the illustration. Develop a wish list based on where students would go if they could fly. What would they do? Use as a springboard for poetry and artwork. My New York, Kathy Jakobsen. Boston: Little, Brown, 1993. New York City (Cities of the World). Children’s Press, 1997. Grandmother and I, Helen Buckley. NY: Lothrop, Lee & Shepard, 1994. Hotter than a Hot Dog!, Stephanie Calmenson. Boston: Little, Brown, 1994. Luka’s Quilt, Georgia Guback. NY: Greenwillow, 1994. Hooray for Grandma Jo!, Thomas McKean. NY: Crown, 1994.